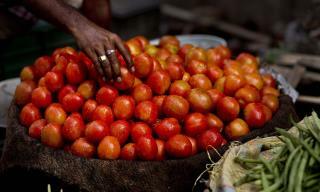 (Newser) – In a move to protest skyrocketing tomato prices in India, the Indian National Congress political party launched the “State Bank of Tomato,” a parody bank taking fruit deposits and distributing loans. But the political stunt by the youth wing of the opposition party has gained traction in Uttar Pradesh’s capitol, Lucknow, reports the Times of India. Operating during typical business hours daily, the bank claims it will return five times an initial tomato deposit and provides loans to those who cannot afford the popular fruit at current market rates. Per the Washington Post, the hike in tomato prices, said to have quadrupled since June to $1.60 per kilogram, comes after a monsoon wreaked havoc on the crop. Though the prices will likely stabilize in a couple weeks, the toll of such a hike is being felt well beyond the country’s poorest. Well. They say tomato juice is good for getting rid of skunk smell. Maybe it could work in india. I love my BLTs. Thank Vishnu I wasn't born in India. I wonder when the rest of the world will ketchup to this idea?